Gary Jacobs was named Caesar Creek Flea Market’s 2018 Employee of the Year. He also does work for Azek TimberTech and Custom Molded Products. WILMINGTON — Gary Jacobs earned recognition from Caesar Creek Flea Market as its 2018 Employee of the Year and has also met his goal of living in his own apartment. His Service and Support Administrator Katie Howard said Jacobs has had “pretty much a whole turnaround about life,” and seems like he’s really enjoying things more. 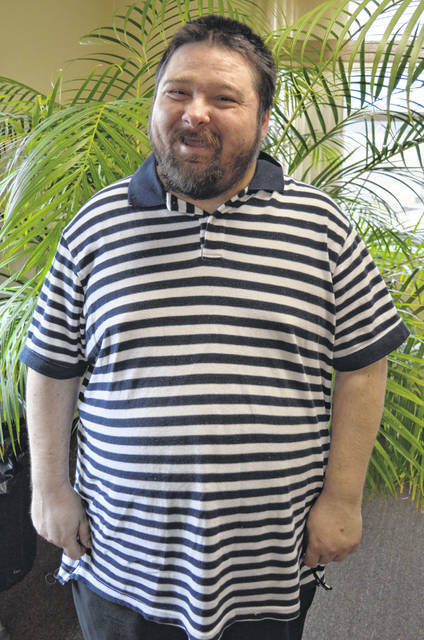 March is Support Matters Month (formerly called Developmental Disabilities Awareness Month) and Howard recommended Jacobs be featured this month because his life is such a positive story. Jacobs began working at the flea market last year in April. He takes care of trash, wipes up tables, and has done stocking when asked to work an extra day or so. Jacobs said he likes the weekend job and sees people he knows as they shop. He also works Mondays and Thursdays at the Person Centered Services’ (PCS) Clinton Career and Life Enrichment Center on State Route 730 near Wilmington. There he is employed on the work floor for two local companies — Azek TimberTech as well as Custom Molded Products. Jacobs labels products for Azek, and he operates a Custom Molded Products machine that was brought on-site to the center. When he’s not working, his favorite place to go is Kings Island where he is accompanied by staff and a lot of friends. Jacobs also is on the Special Olympics bowling team, goes to movies and likes to go out to eat. He said he’ll be eating out at Longhorn Steakhouse on April 1 when he celebrates his 36th birthday. Howard said Jacobs is doing well on his life skills. He changed service providers about a year ago, and for one thing, he’s getting out in the community for more socialization. When Howard said Jacobs seems to be coming out of his shell, he laughs in a way expressing happiness. She said it seems like his social anxiety has lessened, and in his home life he’s keeping up on things with some assistance on homemaking and personal care from his new service provider Divine Residential Living. Jacobs brought up he will visit Cleveland in July for a vacation with one of his providers. A future prospect for Jacobs, if transportation could be worked out, would be a job at Kings Island, said Howard. Jacobs’ Employee of the Year award sure would look good on an application. Here’s hoping.